Any bicyclist knows that maps can be quite deceiving at first glance. The first time I tried to traverse San Francisco on a bicycle, I foolishly set out from the bike-rental shop on Fisherman’s Wharf with a basic street map, and decided that I’d avoid downtown traffic by heading south across the grid. While I was correct that the city’s connected street grid offered many direct routes, I neglected to notice the huge ridge of Pacific Heights looming directly ahead, or the numerous full-stop intersections along the way that would further sap my momentum. University of Maryland professor Hiro Iseki also appreciates how a substantial climb can turn a pleasant ride into a hard slog. On his bike commute, “one last segment of University Boulevard, on the west side of the campus, is the hardest part for me — not just because of the slope, but because of the traffic.” Together with former graduate student Matthew Tingstrom, who first suggested the topic in a class, Iseki has used GIS analysis to analyze how overlapping factors might affect how far bicyclists are willing to travel. These maps can identify routes and destinations that require a similar amount of effort to cycle to, and offer an opportunity to find routes that won’t leave cyclists drenched with sweat. Planners define a “bikeshed” as the area that’s easily bikeable from a given place, similar to how a watershed is the area from which water flows to a given place. Defining the parameters of “easily bikeable” can take into account many different and overlapping factors. The “travel impedance” factors that Iseki has overlapped include distance, terrain, and street connectivity. Many available mapping applications measure distance, like Walk Score, and some also measure vertical distances, like GoBikeBoulder or MapMyRide, but few have quantified connectivity’s impact on travel routes. The research was recently presented as part of the university’s Smart Growth webinar series and at 2013’s Transportation Research Board annual meeting, and is currently under review for publication. Iseki takes as a baseline 50,000 Joules of energy, which is the energy expended during an easy, seven kilometer (4.43 mile) non-stop bike ride across flat terrain. (A typical bike commute in the United States is of approximately that length.) The same amount of energy would take the same rider a shorter distance uphill, and even less distance if the rider also has to wait to cross busy streets. Iseki’s model calculates the number of full stops, and thus efforts to regain speed, necessary at each potential right or left turn, from or onto a busy street. Each of these turns, he calculated, eats anywhere from 367 to 1466 additional Joules of energy compared with not stopping. Applying these impedance factors to the bikesheds around test locations shows that many nearby areas might be difficult to reach by bike — whether because streets don’t connect there, hills get in the way, or too many stops would be required. For instance, the imperfect street network around the test locations puts about 40 percent of the area out of reach, compared with a (theoretical) flat, non-stop, straight-line bike ride, since streets don’t connect across gaps like rivers or railroad tracks. Overlapping more impedance factors further reduces the area that’s within an easy bike ride. In relatively flat and gridded Bethesda, factoring in hills shrinks the bikeshed by 83 percent, and adding in stops at intersections shrinks it by 90 percent. In the hillier and less contiguous neighborhood of Lyttonsville, topography shrinks the bikeshed by 93 percent, and together with intersections reduces the bikeshed by 96 percent. The modeled bikeshed for all Purple Line stations varies tremendously. The pale yellow area is a straight-line distance; the “Method 5” red area incorporates the slowing effects of hills and intersections. The “Method 4” blue areas would be accessible if it weren’t for required stops at intersections. Map by Hiro Iseki. While topography is by far the largest factor that gets in bicyclists’ way, intersections have a huge impact. In both the Bethesda and Lyttonsville cases, bicyclists could access 70 percent more destinations if it weren’t for the constant stops and starts demanded by major intersections. The research uses as its test bed several neighborhoods along a forthcoming light rail line running across Montgomery County, Maryland, just north of Washington, DC. Iseki suggests that the analysis might be a good starting point for mapping out new Capital Bikeshare docks, as that system expands throughout Montgomery County. Not much can be done about Maryland’s rolling hills, but Iseki notes that policy reforms can ease the way across intersections. He points out that one inspiration for his research were the bike boulevard routes in Portland, which “make it easy for a bicyclist to travel throughout the city” by “eliminating stops and keeping continuity of bike paths.” Of course, another policy, the Idaho stop, could also considerably smooth the path for cyclists. An island of lightly trafficked streets surrounds San Jose City College. Map by Mekuria, Furth, and Nixon. Although Iseki’s research did not factor in the area’s bikeway network, he noted that his methods were complementary to those used by another study team that examined “low traffic stress” bike routes within citywide street networks. In the Mineta Transportation Institute’s 2012 report “Low-Stress Bicycling and Network Connectivity,” Maaza Mekuria, Peter Furth, and Hilary Nixon found that 64 percent of San Jose’s streets were within “islands of low traffic stress connectivity.” These “islands” had calm, safe streets suitable for a wide population of cyclists, but were separated by “high stress” streets with lots of fast-moving traffic. Combining the two GIS research methods, as Iseki hopes to do, could map out opportunities for cyclists to connect around hills and across busy intersections — and yield even more insights about how to create bike routes that leave cyclists smiling, rather than sweating. Research like this is exactly what we need in order to plan more effective bicycle infrastructure. I’ve been saying for a long time that bike routes need to be planned with minimum of stopping, preferably none. In crowded cities that will require either full or partial grade separation. Sure, this is more costly than a surface route, but it will greatly increase the potential travel radius of any given cyclist. The key is how to most cost effectively make sure that a cyclist can proceed from their origin to their destination without needing to stop or slow down. Idaho stops are mentioned as a possible tool. However, they only work at less crowded intersections which are empty most of the time. Practically speaking, they should really be yields, rather than complete stops, provided lines of sight allow that. However, whether you use Idaho yields or Idaho stops, they’re not an effective solution in crowded cities where cross traffic often requires waiting for the green even if passing reds is allowed for cyclists. Here is where you need to think in terms of grade separation. A fairly low-cost idea might be protected bike lanes at grade level in between intersections. At intersections the lane splits. Right or left turning cyclists remain at grade level. Right-turning cyclists should always be able to proceed, regardless of light color, as they don’t conflict with motor traffic. 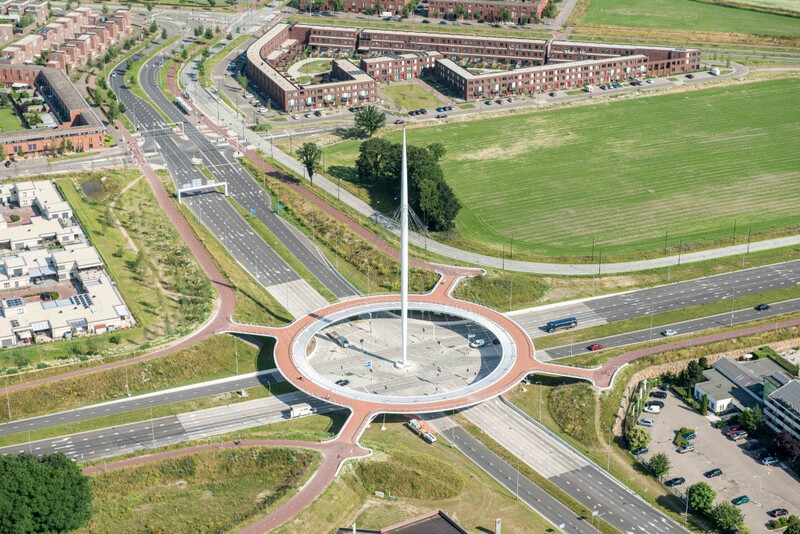 For cyclists going through the intersection, there is a path which dives under the intersection. This is more practical than an overpass for several reasons. For one, it likely costs less. Second, you only need to go down about 7-8 feet instead of going up 15+ feet. Third, the cyclist can use the momentum gained going down to carry them back up, effectively making the grade change painless from an energy standpoint. You can’t do that with an overpass where you have to slog up before you can go down. There are myriad other solutions here as well but the study suggests that we seriously need to think about maintaining momentum when planning bike routes. If we require stops, then they should be in places where cyclists are likely to be going fairly slow anyway, such as at or near the top of a hill. A stop midway down a long hill is about the worst thing you can do to a cyclist. It’s difficult and dangerous to stop from high speeds. And a lot of energy is lost. This is especially important if you’re going uphill right after going downhill. If you don’t need to stop, you can use the energy you built up going down hill to carry you up hill. If you stop, you’re forced to slog up the hill. This is really useful research. In my city, many of the main thoroughfares are flat, but there are a lot of hilly residential streets. Particularly where I live and the neighborhood next door. When I am coming from the north, I try to pace myself perfectly, to time the green light to make it up the hill to my neighborhood. If you have to stop at the intersection, powering up the hill is that much harder, the section right after the intersection is the steepest. I’ve also found, that the time on the Google maps, for bicycling directions can be quite off if you follow the traffic laws, and stop at stop signed. Easily adding 20-30% more time. Great research! Similarly, the availability of transit that allows bikes onboard is also huge boost to acceptable non-sweaty biking ranges. For example, while it’s wonderful that BART now allows bikes onboard at any time in the Bay Area, it passes through some of the flattest neighborhoods in the city of SF. Meanwhile, the SF Muni Metro lightrail system, some lines of which pass through or on the biggest hills, does *not* allow bikes on at *any* time. I usually just do #1. Option #3 is possible, though less attractive to the average person, especially those just casually interested in biking to get around. SF Bus drivers seem to openly disdain people with bikes due to the inconvenience, even if you know how to use the racks (and if you don’t, they *don’t* want to show you). And, let’s face it, it’s not as convenient to wait for a bus, hoist the bike up to the rack, then ride the bus as it indirectly wiggles its way up and down a hill. Not to mention that the rack only takes two bikes at a time. Full? Wait for the next bus in 20+ minutes. It’s these kinds of things which really discourage ridership. Unsurprisingly, I don’t see too many bikes in that neighborhood compared to other SF neighborhoods. The Muni Metro cars are just too small for people to bring bikes on, as convenient as it might be. I can’t imagine anywhere that would be out of the way. Have you considered going around the hill down Laguna Honda? It seems not that bad a route to downtown and a much more gradual grade coming back.You would still need to go uphill a bit to the Forrest Hill station area. I think the space issue is more about rush hour vs. not rather than the actual physical space being able to accommodate bikes. I can definitely understand a peak-hours bike ban on MM, for sure. But in off-hours there would seem to be more room. For comparison’s sake, VTA lightrail in Silicon Valley allows bikes because they’ve outfitted them with internal vertical racks. I realize the rack takes up a little room, but it would probably only remove 2-3 seats or something. On 2+ car MMs it could also only be on one of the cars. As for Forest Hill/Laguna Honda, that’s still quite a hill up from West Portal station, at least if we’re judging it by the “non-sweaty bike routes” metric, haha. Hillmapper shows grades around the 9-15% range on each block up to Laguna Honda, so that’s way beyond an effortless bike ride going uphill. Yeah, I’m aware of possible conflicts with utility lines but I don’t think it’s necessarily a showstopper. It might mean you just have to dig down a little deeper (and therefore have more “Wheeeee!” on the downgrade 🙂 ). I’ll bet there are a lot of streets where the idea is quite workable. The larger point is to develop a toolkit which bicycle route planners can use. That could also include using traffic signals with sensors to turn lights green before a cyclist arrives at an intersection. Yeah, it’s almost been enough to make me consider a folding bike 🙂 It’s too bad Muni hasn’t even done an off-hours pilot or something of the bikes-on-board thing, maybe even on just a line or two. This type of analysis will be the source of useful planning information. It focuses mostly on physical effort. There’s another aspect to take into account: the psychological aspects of urban biking, mainly comfort and fear. Most cities include a few intersections that were designed to move the maximum amount of cars at high speeds. Freeway interchanges are a good example. Though these allow thousands of cars to pass every day, many are very difficult places for bicycling, especially if they require the cyclist to take the lane. Even worse is when the cyclist has to take a lane that is not the rightmost lane (for example, when the rightmost lane becomes a dedicated on-ramp). 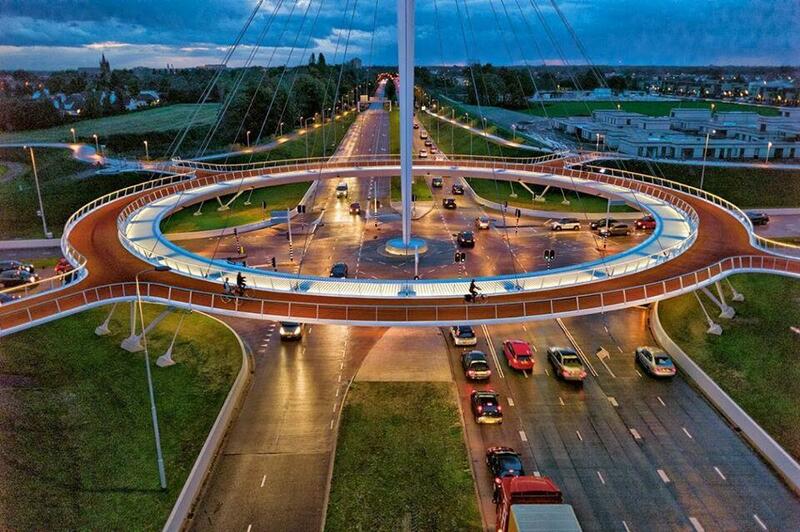 These “hellish portals” can create serious obstacles to all but the most fearless bicyclists. A city can have a 1000 miles if great bike lanes and paths, but if those bike paths are chopped up by gnarly intersections then most people will not use them for daily commutes. It looks like these researchers have most of the software in place. All that is left is to model the “gnarlisocity” of various locations on the map. There is a reason why electric assist bicycle are becoming increasingly popular in hilly Germany. I love the accomplishment of making it up a hard slog of a hill but being able to do a little throttle twist to make it effortlessly up a steep hill while going to work could really come in handy. Why not just use actual power meter data instead of hypothesizing? Most “A-level” cyclists now have one and many upload their rides to Strava or other sites that could be mined. That would certainly be nice, but it takes a long time to get someone to ride from every starting point to every destination, and it’s much easier to do calculations based on the information in a map. It would certainly be more accurate if we had large amounts of data from a representative sample of different cyclists, but unfortunately even apps like Strava don’t have very much data about the entire street grid, only about the main routes that many different people use. This is where expanding Bay Area Bike Share to the neighborhoods outside of Downtown will make a big difference. If I can pick up a bike near home, get to a Muni station, and then know that I can pick up a bike wherever I get off, then I have no need to be tied down by my own bike parking. This is the best thing since wheels. The biggest win here is if we could map the currently accessible “bikeshed”, and then compare it to what the bikeshed would look like if a proposed traffic project were implemented. We just had a rogue traffic engineer add several stop signs on our best/only crosstown bike lane; I would love to be able to show on a map areas that those signs have knocked outside the “bikeshed”. Utilities may get in the way of building a lot of underpasses in existing areas, but new builds don’t usually have the problem. For the current infrastructure, other techniques can be employed to lower traffic volumes at the intersection to more comfortable levels. But if we’re building completely new, I don’t see why bike/ped underpasses can’t be included in the plans from the outset. Planners should really start doing a better job of including bike/ped amenities that connect outside the community into their designs. Also, underpasses should be of decent size and well-lit so that people don’t feel like they’re entering the catacombs. Malmö has some nice ones. This is an excellent point. Often the reason why new stuff is built to poor standards and ideas is due to ‘legacy’. But why shouldn’t best practises be implemented when building afresh, even if the rest of the city is below-par? Because there’s always “no money” at the time of construction, then it’s “too expensive” later on. Unless it’s a highway. Then they approve a billion dollar project unfunded, and worry about it later. Which doesn’t have to be mutually exclusive to bike/ped improvements to begin with. Utilities is another sorry excuse. If your area is anything like mine, they’ll repave, then they’ll come through and work on the water mains, then three months later they’re working on the gas. All projects that rendered the original paving obsolete. Understandably, there are occasionally emergency situations that require immediate attention. But by and large, all of those such projects could be combined and the savings put into providing a utility infrastructure that isn’t incompatible with separation.